In early light, at a great distance, a coyote is aware of the viewer—you—before you are aware of him. The sky is transitioning through multiple parts of the morning, including a piece of a starry night retreating from the scene. Rosy hints of daylight approach, blushing and serene. The stylized, patchwork hills billow through a quilted carousel of fabric textures: chintz, tweed, velvet, brocade, corduroy, and damask. The surface texture on the artwork itself is more dramatic than the majority of my paintings. Why? 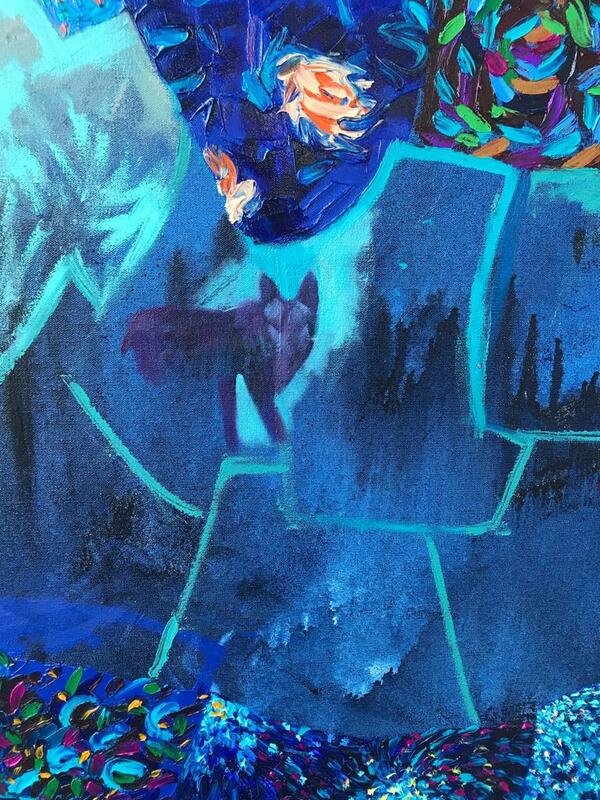 This painting was not intended to be a painting of a coyote (or even a landscape!) until very late in the process. In 2018, the semi-finished version of this painting appeared as a woman’s skirt in my March 2018 show. It was still wet when it was hung—for fun—as a work in progress. By the time it came back to my studio, I had lost so much momentum that I stuffed it away on a shelf: out of sight out of mind. In an attempt to “save” the canvas, I started brush painting organic, geometric shapes freely throughout the half finished work, turning it on its side every hour, looking for the subject to appear. What was once a skirt took on the quality of rolling hills, and as I squinted my eyes…a ghost of the coyote appeared in some scribbles. So I went to CATCH HIM! by defining his little body in the wrinkles of the paint and the play of the light. Once he was in, everything fell into place. There’s no green in this painting and no trees either because it’s the desert. But it’s a special kind of desert where time is standing still between the night and day sky. The red volcanic soil is swelling into purples and undulating arid pinks. There’s colorful dust blowing through the famous Southwest light. I have a strong feeling about this painting because it represents waiting, longing, searching, and finding—all at once. Coyotes have been my favorite animals since I was little. They have patiently waited for ten years to be a subject in a painting and finally got their chance. 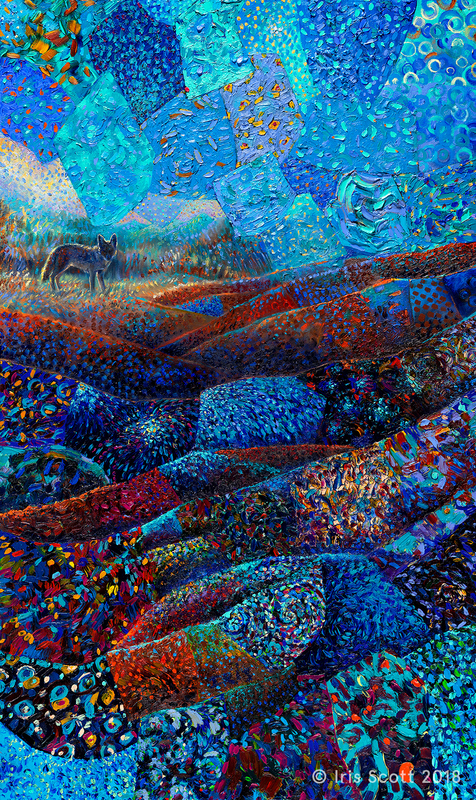 I also think the coyote is a metaphor for New Mexico, where I intend to move to after New York. 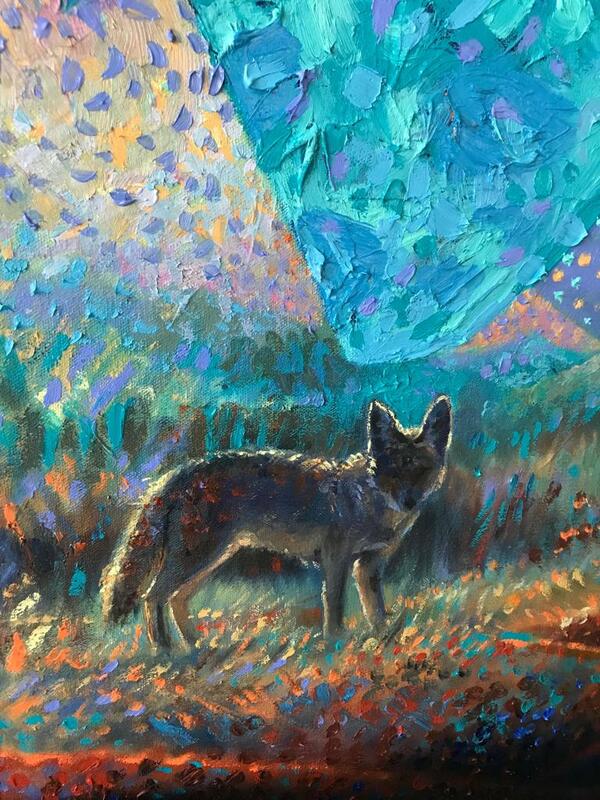 The hills between the coyote and me are all the steps in time I have to take to get there, including painting for this show and tying loose ends before I can take to the sky.